Boar who becomes one of the rebellion’s most valuable leaders. After drawing complicated plans for the construction of a windmill, he is chased off of the farm forever by Napoleon’s dogs and thereafter used as a scapegoat for the animals’ troubles. A pure communist leader who was influenced by the teachings of Karl Marx. He wanted to improve life for people in Russia, but was driven away by Lenin’s KGB. An old boar whose speech about the evils perpetrated by humans rouses the animals into rebelling. His philosophy concerning the tyranny of Man is named Animalism. Wants to unite the working class to overthrow the government. 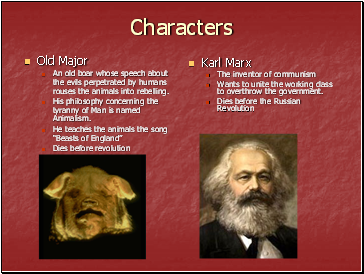 Many of the ideals behind the Soviet revolution were based on the writings and teachings of Karl Marx. A German intellectual who lived in the mid-1800s, Marx believed that societies are divided into two segments, a working class and an owner class. The working class creates all the products, while the owner class enjoys all the benefits of these products. This class division leads to inequality and oppression of the working class. 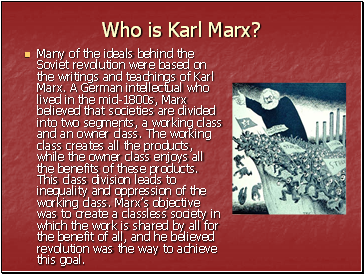 Marx’s objective was to create a classless society in which the work is shared by all for the benefit of all, and he believed revolution was the way to achieve this goal. We already know that a fable is a narration intended to enforce a useful truth. 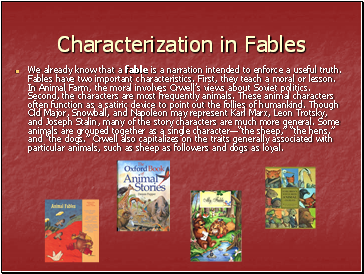 Fables have two important characteristics. First, they teach a moral or lesson. 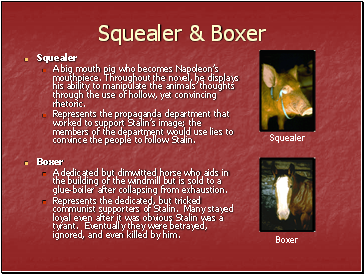 In Animal Farm, the moral involves Orwell’s views about Soviet politics. Second, the characters are most frequently animals. These animal characters often function as a satiric device to point out the follies of humankind. 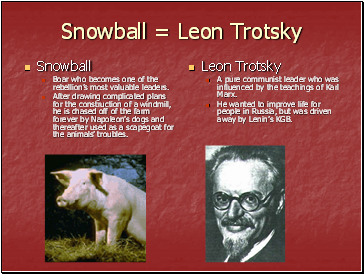 Though Old Major, Snowball, and Napoleon may represent Karl Marx, Leon Trotsky, and Joseph Stalin, many of the story characters are much more general. Some animals are grouped together as a single character—“the sheep,” “the hens,” and “the dogs.” Orwell also capitalizes on the traits generally associated with particular animals, such as sheep as followers and dogs as loyal.